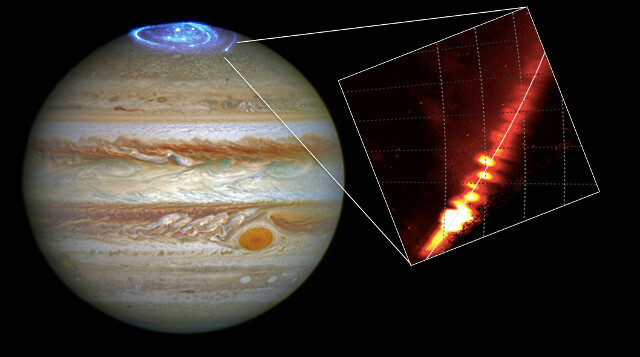 An article published in the journal “Science” describes a research on the influence shown on the aurorae at Jupiter’s poles by its moons Io and Ganymede. A team led by Alessandro Mura of the National Institute for Astrophysics in Rome, Italy, analyzed data collected in particular from the NASA’s Juno space probe’s JIRAM instrument, discovering that Io leaves a series of long traces in Jupiter’s aurorae while Ganymede leaves a double “shadow” in them. Aurorae in the planet Jupiter’s polar regions have already been the subject of various researches based on data that the Juno space probe has been collecting since it entered the gas giant’s orbit, on July 4, 2016. Bright spots are present just outside the aurorae’s oval. The spots were explained as the product of a plasma precipitation caused by the interaction with the two innermost large moons, Io and Ganymede. In simple words, the orbits of the two moons generate perturbations in the plasma accelerating it along the magnetic field lines that go from the moons to the planet. The consequence is that the spots are visible at the North and South bases of the magnetic line and leave footprints in them. In some cases, two traces for each hemisphere are visible. The top image (Courtesy NASA/HST/A. Mura/INAF-IAPS. All rights reserved) shows Jupiter with the north pole aurora and in the inset the multiple trace left by Io. The shape of the “shadows” left by Io is that of Kármán vortex streets, with the consequence that in both of Jupiter’s hemispheres there’s a main spot and a series of secondary spots with an alternate arrangement. Alessandro Mura commented that the only hypothesis is that the interaction between Io and the surrounding plasma is very different from how scientists imagined it. Alessandro Mura’s team also examined the double trace left by Ganymede, which until now had never been observed and is now clearly visible in the image righ below (Courtesy JIRAM/A. Mura/INAF-IAPS, all rights reserved). The two spots are about 100 kilometers apart and according to the researchers therea are two of them due to the interaction between the magnetosphere of Ganymede, the only known satellite with a magnetic field, and Jupiter’s plasma. The bottom image (Courtesy JIRAM/A. Mura/INAF-IAPS. All rights reserved) show a series of footprints left by Io on Jupiter’s aurorae on September 1, 2017. Panel A shows the south pole footprint seen with the main spot on the upper left and various secondary spots. Panel B shows a detail slightly after the spots on panel A. Panels C, D and E show the north pole footprint at various times of that day. 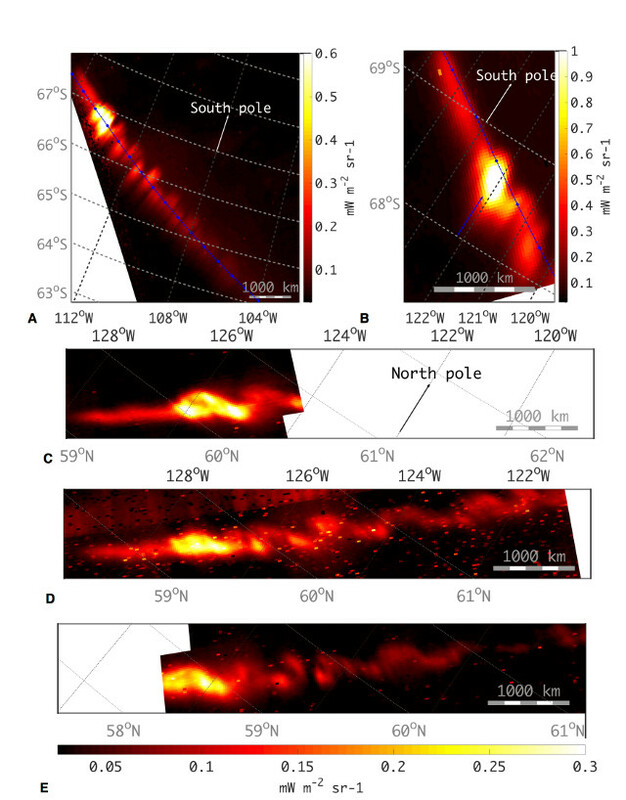 Generally the study of aurorae is used to gather information on the interaction between the magnetosphere of the Earth or another planet with solar wind. In this case, more complex interactions than expected between Jupiter and two of its major moons were discovered and this allowed to gather new information on the effects generated by powerful magnetic fields in a natural environment.